Who's starting in net tonight? 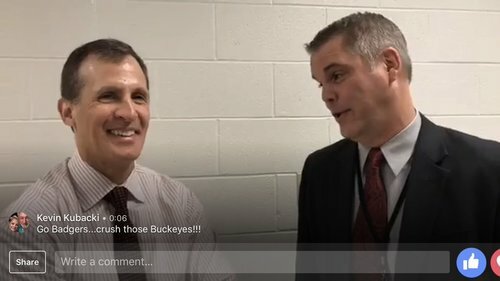 Find out on our Facebook Live pregame interview with head coach @TonyGranato . Leading goal-scorer Nick Schilkey out again tonight for Ohio State against UW. 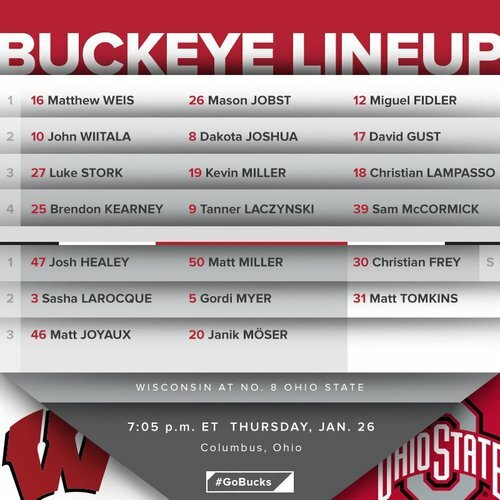 Freshman Tanner Laczynski is back in the Buckeyes' lineup. Time to take the ice in Columbus. Puck drops 7pm (ET) in Columbus. Thursday night hockey...let's do it. 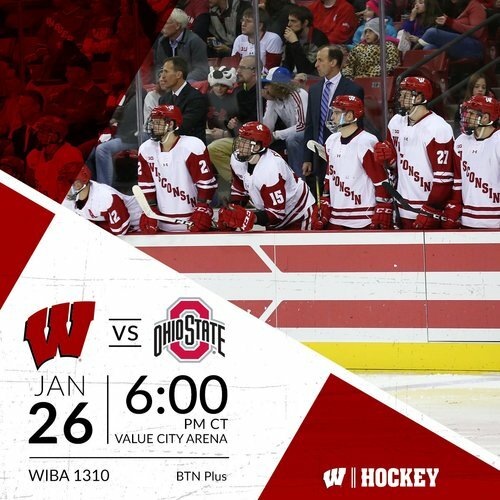 Badgers and Buckeyes coming up in just over 20 minutes. Locked in and ready to go. Wisconsin vs. Ohio State at 7. Let's drop the puck. ???? Buckeye starters and lineups for the game vs. the Badgers. 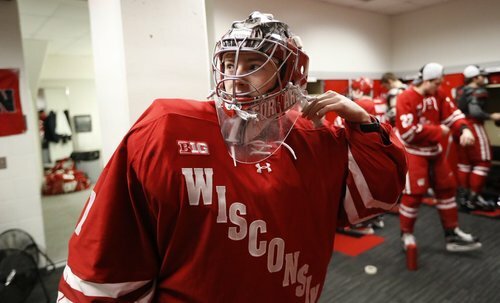 Jack Berry gets the start in goal tonight for the #Badgers at Ohio State. Christian Frey goes for the Buckeyes. And we're underway! 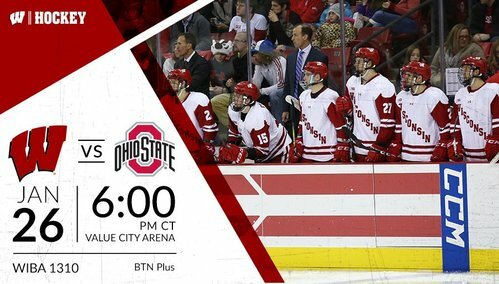 11-8-1 Badgers take on the 12-4-6 Buckeyes in Columbus! OSU 0, UW 0, 18:35 left/1st. Buckeyes on the first power play of the night after a hooking call. Sexton takes a hooking penalty 1:25 into the first and UW will send out the PK unit for the first time tonight. After Berry makes big saves on his end, Luke Kunin gives UW a 1-0 lead with a short-handed goal 3:24 into the first. UW takes a 1-0 lead with a shorthanded goal with 1 second left on the power play. UW also kills off the Sexton minor with some nice saves from Berry on the PK. Badgers now 87-for-100 on the season in PK. #Badgers are 8-1-1 this season when scoring first. Buckeyes are 1-1-4 when allowing the game's first goal. Luke Kunin's goal was @BadgerMHockey 's third short-handed of the season. Trent Frederic has been involved in all three (goal, 2 assists). UW 2, OSU 0, 11:14 left/1st. UW converts after a turnover. Matthew Freytag scores on a pass from Cameron Hughes to put the #Badgers up 2-0. 11:14 left in the first. Big chance for Will Johnson in the slot but he is denied by Frey. UW still leading 2-0 with 8:05 to go in the opening frame. OSU with some offensive pressure but Berry stands tall with some help from the post. 2-0 UW with under six minutes to play in the first. 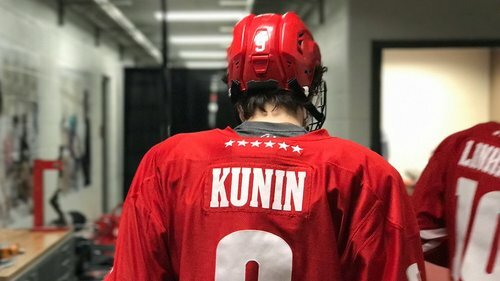 Minors assessed to both Kunin and Weis so teams will be 4-on-4 for two minutes. 5:41 to go in the first. Kunin and Weis step out of the box and teams are back to even strength. Under 3:30 to go with UW up 2-0. 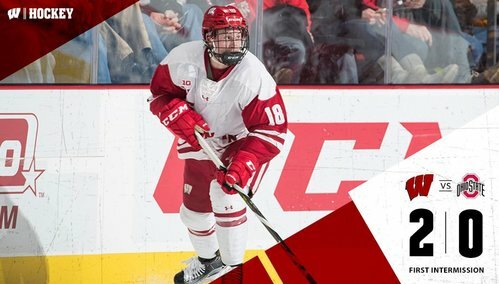 End 1: Wisconsin leads Ohio State 2-0 on goals by Kunin (SH) and Freytag. First time in 12 games UW hasn't allowed a first-period goal. Teams back out for the second period with UW up 2-0. Badgers also lead in shots on goal 11-7. Back for the second period. Wisconsin up 2-0 on the road. Teams start 4-on-4 with Frederic and Joshua getting roughing minors. Teams back to 5-on-5. Two minutes gone by in the second. Ohio State's Matthew Weis scores to cut Wisconsin's lead to 2-1 in the second period. Ohio State makes it 2-1 with 15:32 to go in the second.